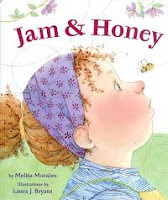 Bookmark: Melita Morales, "Jam and Honey"; Diane Muldrow, "Where Do Giggles Come From? "; Margaret Wild, "Piglet and Granny"; Il Sung Na, "A Book of Sleep"; Robert McCloskey, "Make Way For Ducklings"
Melita Morales, "Jam and Honey"; Diane Muldrow, "Where Do Giggles Come From? "; Margaret Wild, "Piglet and Granny"; Il Sung Na, "A Book of Sleep"; Robert McCloskey, "Make Way For Ducklings"
Alas, after the seemingly endless cold winter, we are soon to be revitalized with the coming of spring and the sweeter things in life: daffodils sprouting boldly yellow in the green grass, pink tulips reaching for the clear blue sky. It is a good time to pick up a bright new book to add to your enjoyment of the season. The freshness of springtime is reflected in these breezy, wholesome new picture books for the very young. An adorable, round-cheeked little girl and a happy bumblebee gaze at each other with a mixture of surprise and fear on the cover of this book illustrated by Laura J. Bryant. The girl has been picking berries for a sweet treat, and the bee is gathering nectar when the two chance upon one another. The story is told first from the point of view of the girl and then from the bee’s perspective. They are equally startled by their close encounter, but each knows what to do. Mama says stay still and the bee will go away; mama bee says fly high and the girl will move away. Thankfully, there are plenty of berries for both. And nectar for the bee. Bright greens, pinks and purples in these watercolor illustrations give springtime charm to this sweet tale. Readers can trace the bee’s flight path and look for the pigeons on each page. Bryant’s meticulous paintings include details like the jam and honey jars sitting side by side in the window of the little girl’s house. This book deals well with the common childhood fear of stinging insects. Moms have been known to say, “That bee is more scared of you than you are of it.” After reading this book, children will believe it. Where Do Giggles Come From? Little Golden Books are practically guaranteed to please youngsters from the first read to the fiftieth. The distinctive gold foil spine trumpets great stories from the past like “The Poky Little Puppy,” whose naughtiness eventually catches up to him, and “The Tawny Scrawny Lion,” who never could get enough to eat. 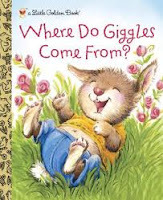 “Where Do Giggles Come From?” is an engaging new addition for your Little Golden Book collection. It is illustrated with appealing animal babies and their parents doing the simple, spontaneous things that come naturally to joyful families: playing this-little-piggy and peek-a-boo, turning upside down, splashing, laughing and hugging. This lively, rhyming book invites snuggly kisses, belly tickles and silly faces. It will surely have youngsters giggling. Piglet has learned a lot of really cool things from Granny like how to run fast and do somersaults down a hill. Even before meeting Granny, the reader knows that she is someone who can turn an ordinary day into great fun in the outdoors. On the morning that Granny does not come, Piglet shows Cow, Horse, Duck and Sheep the clever things that her Granny has taught her to do. Soon Granny arrives with another great idea – a surprise that has them swooshing and sliding with abandon. 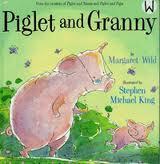 Granny and Piglet don’t need fancy toys or shopping trips to enjoy their time together. They share their love in simple springtime activities like swinging on gates and looking for tadpoles. The delight of Granny’s visits lies in the simplicity of being themselves and being together. Stephen Michael King illustrates with watercolor and black ink, creating smiling animal characters with real human appeal. Wild’s story sends a clear message that happiness is spending time with someone who loves you. 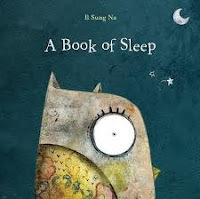 Something about this board book urges the reader to quickly get cozy under the covers and relax into the night. Perhaps it is the dark, soothing colors that set the tone for bedtime. Maybe it is the creatures, thoughtfully illustrated with color and pattern, bringing texture and charm to each. 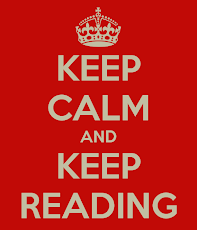 Or, it could be the simple cadence of the text, which begs to be read in a whisper. It is a great looking book. The cover is as dark as night, contrasting with the great, white eye of a watchful owl who observes the many varied ways that other creatures sleep. And just when the reader is lulled into a peaceful trance, the sky brightens, the sun takes over the page, and the animals awaken. But the tired owl sleeps on a branch, framed by the rising sun. On the back cover, the sky is light and the owl’s great eye is closed in darkness. Tuck the babies in to bed with this lovely book. What more can you say about a book that won the 1942 Caldecott Medal, has sold millions of copies, and is the official children’s book of the Commonwealth of Massachusetts? All I can say is buy it. This is not a book to be returned to the library; this is one that you will want hanging around the house in perpetuity, beckoning to be read again and again. This one will suffer wrinkles, torn pages, and foody fingerprints and will still be loved. It may even force you into a vacation trip to the great city of Boston. The magic is in the illustrations. McCloskey gives readers a duck’s-eye view of Boston both from the ground and the air. His wonderful charcoal drawings present a sort of travelogue of the Public Garden, Beacon Hill and the Charles River. But it is the personality and realism with which he renders Mr. and Mrs. Mallard and their darling ducklings that truly bewitch his audience. The story is uncomplicated. It is spring, and Mr. and Mrs. Mallard have to find a suitable place to lay their eggs. They are very proud of the little family that hatches, and are kept very busy with the responsibility of taking care of eight ducklings. 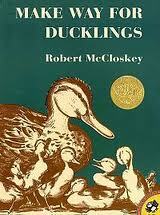 Soon, Mr. Mallard must take a trip, and Mrs. Mallard sets to work teaching the ducklings the things ducks must know. My children love the earnest, funny ducklings as they waddle along behind their mother. I find inspiration in Mrs. Mallard’s straightforward confidence in raising her progeny. When at last she felt perfectly satisfied with them, she said one morning: “Come along, children. Follow me.” Before you could wink an eyelash Jack, Kack Lack, Mack, Nack, Ouack, Pack and Quack fell into line, just as they had been taught. Mrs. Mallard led the way to the water and they swam behind her to the opposite bank. With a little help from some friendly policemen, Mrs. Mallard leads her ducklings to the Public Garden to rejoin their father. They make their new home there on a little island in the pond and spend their days following the swan boats and eating peanuts. Last summer my family found ourselves quacking our way through the Boston Public Garden, riding a swan boat and feeling like we were right in the middle of “Make Way for Ducklings.” It was an unforgettable experience. Thank you, Robert McCloskey. M. D. Clark has taught her children to walk in a line, to come when they are called, and to keep a safe distance from things with wheels. They protest, however, that they are not ducks.